The Volkswagen Golf has known timeless popularity, ever since it was known as the Rabbit here in the United States. Since then, the model has evolved to grow with the changing times and offer the specs and features today’s drivers are looking for. This includes adding an extra element of utility and space with the release of the Golf SportWagen. For 2018, the VW Golf SportWagen comes with a long list of benefits and features that make it the perfect choice for weekend warriors and small families alike. Drivers behind the wheel of the 2018 Volkswagen Golf SportWagen can appreciate its 1.8-liter TSI turbocharged and direct-injected 4-cylinder engine, which offers up an impressive 170 horsepower. Buyers also have the choice between a five-speed manual or six-speed automatic transmission. The new SportWagen also features an MQB chassis architecture and is made of high-strength steel, making it sturdy, durable and lightweight. Also available with this impressive model is its 4MOTION all-wheel drive system for an added element of security on the road. 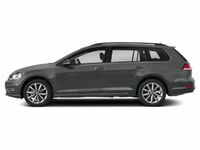 A great choice for drivers that like the sporty style of the Volkswagen Golf, but are looking for something with more interior space, the 2018 Volkswagen Golf SportWagen features an elongated shape designed to offer more space inside for cargo. In addition to offering seating for five passengers to sit comfortably within 94.3 cubic feet of passenger space, the SportWagen also has 30.4 cubic feet of designated cargo space. Those looking for more room for storing can fold down the rear seats to expand it to a spacious 66.5 cubic feet of max cargo space. For more information about the new 2018 Volkswagen Golf SportWagen, contact us today here at Broadway Automotive. Just give us a call or click the button below and we’ll be happy to answer any questions you may have or set you up with a test drive in the model of your choice.